Good Monday morning. I have really enjoyed playing with the new Impression Obsession fall winter die release. I always love it when they release scenic dies that can be used for masculine cards. My first project was made using the new Spotted Deer Frame layered over the Tree Frame with stamped Fir Trees in the background. I embellished the card using Cardinals, Pine Sprig Clusters and framed it using the All-in-One Frames Rectangles 2. 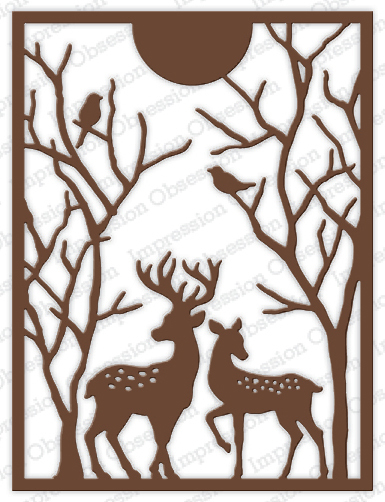 Cut the All-in-One Rectangle Frame, Spotted Deer Frame and Tree Frame using Kraft cardstock. Apply the Antique Linen ink pad directly on the frames and then follow by applying the Vintage Photo ink pad directly on the frames. Cut two ground snow sections. Apply double stick tape to the lower back of rectangle frame and attach one ground snow section. Apply double stick tape all the way around the back of the frame and attach the Spotted Deer Frame. Apply thin strips of mounting tape to the back of the Spotted Deer Frame and attach the Tree Frame. The double mounting tape layers will help add dimension to the scene. Secure the blue card base and fir tree in the MISTI and stamp the tree background using Peeled Paint ink. I stamped each tree twice for darker coverage. Apply double stick tape to the back of the frames and attach it to the card base. Color the deer using mini applicators and Antique Linen and Vintage Photo ink. Attach the second snow ground piece to the front of the frame using double stick tape. Apply glossy accents to the back of the deer legs and tuck them in behind the front snow and attach legs to the back snow piece. Cut cardinals using red cardstock and apply black to the beaks using a black Copic marker. Apply small pieces of mounting tape to the back of each cardinal and attach them in the branches and on the ground snow. Finish by apply glossy accents to the pine sprigs and tucking them in behind the front snow section. My second project is a 3 x 3 gift card made using the Squirrel Circle set and Tiny Single Leaves. This is a small set and perfect to use for gift cards or tags. 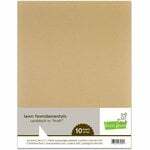 Cut both the tree layer and squirrel layer using 2.50″ squares of white cardstock. Cut a small white ground section using deckle scissors and color it with a mini applicator and Peeled Paint ink. Color the trees and squirrel using mini applicators and Antique Linen and Vintage Photo ink. Apply a swatch of color on a piece of white scrap cardstock using mini applicators and Fired Brick and Spiced Marmalade. Cut the tiny leaves out of the swatch of colored cardstock. Trim around the tree background layer to make it fit well behind the front circle frame. Apply double stick tape to the small green ground layer and attach in front of the trees. Apply strips of mounting tape to the back of the Squirrel layer, line it up directly over the tree layer and attach. Apply mounting tape to the back of the framed layers and attach it to the blue card base. Finish the scene by attaching the tiny leaves to the branches and ground area using glossy accents. 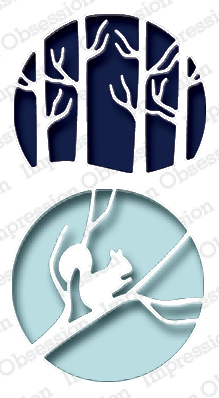 I hope you have enjoyed seeing the projects I made for the Impression Obsession Fall Winter Die Release. Be sure and check back tomorrow to see two more projects that are festive and fun for Christmas. What gorgeous scenes you’ve created with these beautiful dies! Love the winter scene with the deer and cardinals, and your adorable fall scene with the cute squirrel! Gorgeous scene, the layering is amazing! Oh my goodness! These two cards are incredible! Love the pops of colors in the leaves and birds make on your scenic cards. OHHHH…I love the layered deer card. Beautiful!!! …and the squirrel card is so cute! These are frameable cards – they are so nice! I would frame that stunning deer card! And the squirrel card would make any recipient smile! Always love your detailed scenes and these two are wonderful! Oh my goodness these two cards are so amazing! They really should be put behind a picture frame they are just so lovely to look at! So many beautiful and colorful layers of happiness! I absolutely LOVE layered cards and these are awesome! I cannot wait to do my own variation. These are awesome and I love your choice of colors. Love your use of dies to create wonderful scenery cards– the squirrel card is cute but the deer frame is absolutely gorgeous! Great cards! Your die cuts always seem so lifelike! What amazing cards! They are very inspiring. Absolutely fantastic card!!! Love all the various dies and the way you bring them to life!!! And just have to say that squirrel circle is just so cute!!! I’m always amazed at the scenes you create on your cards! This is so awesome. I always need good ideas for masculine cards. J’adore ! C’est une très jolie carte et j’aime toujours autant vos petites scènes. Celle-ci est vraiment magnifique. Kittie you never disappoint. Your work is like a little canvas of art. These two cards are so beautiful. Very delicate work. Your work is exceptional. I see it all the time on IG & admire how you make your cards come to life with pretty scenes. sprinkled among the trees is wonderful. Love the beautiful woodland scenes you created. I just knew when I saw that squirrel circle die set in the release that it would make a great Kitty card! And it did 🙂 Love them both!!! Love these amazing scenes! The attention to detail & fabulous layering is awesome on both cards! Awesome cards! that deer scene is amazing!! Thanks for sharing!! Fabulous cards! I always love your framed creations, they are filled with such wonderful details. Thanks for sharing your beautiful cards. I really love the deer scene. Wow, amazing cards! Your details are beyond incredible. You are a true paper artist! That little squirrel is too fun. A GORGEOUS SCENE on BOTH of your cards, Kittie!!! LOOOVE the first one the most! Of course, I LOOOOVE scenes with deer! PERFECT for Christmas! AND the little squirrel is SO SWEET & PERFECT for fall!!! EXCELLENT JOB, Kittie!!! 😉 WONDERFULLY DONE!!!!!!! !